Charming Smiles - A finished quilt. I know some of you are curious after my last post as to what I was up to with my colourful button and pretty fabric combinations. I was a tad worried you'd get sick of me showing yet another finished quilt so soon after the last few so I thought it would be nice to have a post of simple eye candy. Plus I thought it was only fair to the buttons to give them a post of their own because little details like that sometimes get lost in the bigger picture. ...I used them on a quilt I made a while ago for a Quilters Companion special magazine dedicated to precut fabrics. 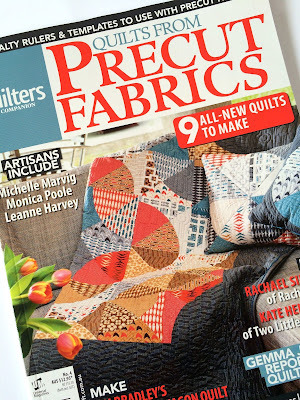 Here's the cover of the magazine Quilts From Precut Fabrics No.4. If you turn to page 88 you'll find my quilt. I called it Charming Smiles because the quilt has been made with 5inch charm squares it's a happy smiley type of quilt. The design is highrise half circles that look a bit like simplified modern clamshells. It was all finished when I spied my jar of buttons and thought "Why not ?". Sewing on the buttons was my favourite part of making the quilt. Of course you wouldn't use buttons on a quilt for babies or young children or even pets that may chew and choke on them. I've been curious to see how the magazine would style Charming Smiles for the photos. I was pleased to see they've created a lovely scene with bunting in a sun filled room, it makes it look like the perfect quilt to curl up in whilst reading a book of wonderful tales. Straight after the pattern there's a 5 glossy page interview with me, interspersed with lots of quilt photos, so this magazine is quite a Rachaeldaisy packed edition. If you're tempted to get a copy Quilts From Precut Fabrics No.4 is available in newsagents around Australia now. Or you can buy a digital copy here which means anyone, anywhere can download a copy. Don't you just love modern technology? Or have a look at Quilters Companion's facebook or website for more information. One last photo, this one is taken by me of the quilt having a turn in the featured position on our lounge room wall. Your happy quilt gets my seal of approval. *#*#*#* The buttons and the rick rack go perfectly with the happy set of pre-cut fabrics. Your STARis on the rise and well deserved. Great fabric. It has a sort of old fashioned look to it, similar to the 1930s prints which remind me of the pinafores my Mum wore when she was doing housework and cooking. The buttons and ricrac suit it well. The magazine article sounds interesting, pleased they included lots of photos. Well done! A very clever and creative (as to be expected from you Rachael) use for buttons! Congrats on your feature too! Charming Smiles looks well at home on your lounge room wall. I just ,love your happy smiles quilt - it is simply gorgeous, and the buttons add a charm all their own! Totally gorgeous and totally you! Such a happy quilt - well done. YEAH YOU!!!!! it's the perfect storm of clam shells, buttons and rickrack!!!! just fantastic in every way! Simply charming, simply cute, congratulations! You never need our approval... you always have it! You would never need my approval to create a beautiful quilt Rachael! What an absolute delight this one it?!! Cheery colours and prints, ricrac, fun shapes and buttons! 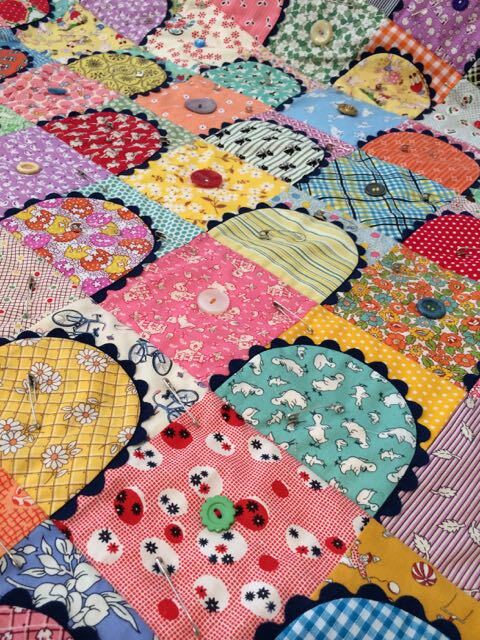 A positively charming quilt which will always bring a smile to one's face! So pretty Rachael. Love the effect of the rick rack and the buttons. So delightful! Charming, indeed with buttons, rick rack, and sweet 30’s repros. How delightful for us and for you to be featured in this magazine. The quilt design is perfect for showcasing fun fabric. Congratulations! This is awesome Rachael ! 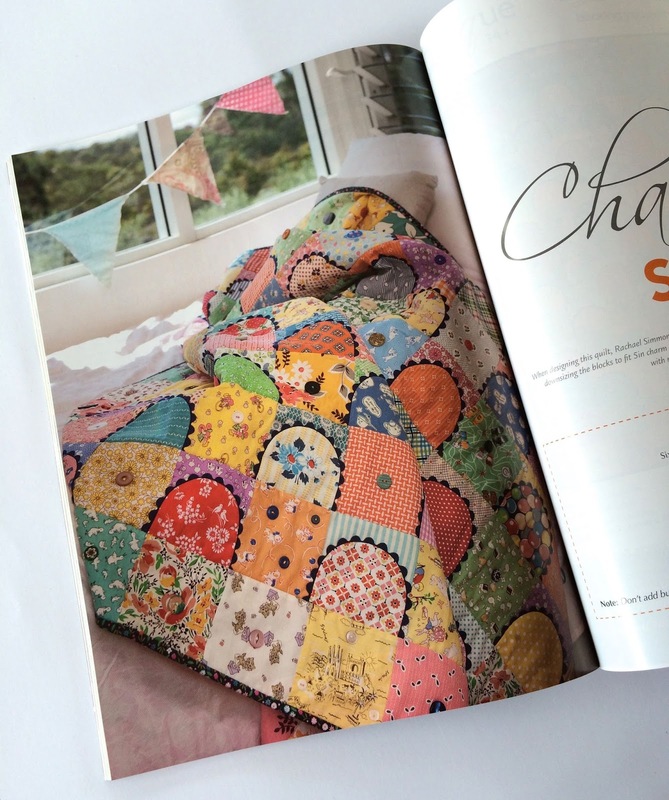 Love the charming quilt and what a wonderful picture of you in the magazine ! Your sweetness shines in your eyes ! You are a star - FIVE GLOSSY PAGES!! I absolutely love your Charming Smiles quilt. When I saw it on your wall I immediately thought of scoops of gelato. I'm so happy for you! You rock!! What a delightful and happy quilt--love it! I will have to get the magazine, because I want a quilt like this of my own--so sweet and fun. Oh, LOrdy...did I catch the charming smiles all half way around the world..thank u so much..sorely needed...and the magazine..Is it out??? I bet there is a line at the bookstore...I will hurry down to get in it..a big congrats to my famous friend. Your quilt is stunning. I love every aspect of it. The magazine did a nice job of displaying it. Congratulations. Congratulations Rachael, I knew there was a quilt hiding amongst those buttons. I'm sure this will inspire a lot of people to get out their cute buttons and make a fun quilt. What a wonderfully happy, sunshiney quilt. I love the additions of the ric-rac and buttons. Your high rise clamshells interspersed throughout look great. You have added great texture to your quilt. Congratulations on your magazine appearance. I will have to keep an eye out for the magazine. What a wonderful way to work buttons into such a cute quilt. I adore the black ric rac. Frames those parts of the quilt so beautifully. Rach- you're on fire. You deserve all the recognition you've received for your work over the last 12 months. Your work is amazing. Absolutely awesome Rachael. Another perfect combination of design, fabric, ricrac and buttons. It's gorgeous and congratulations on the editorial. 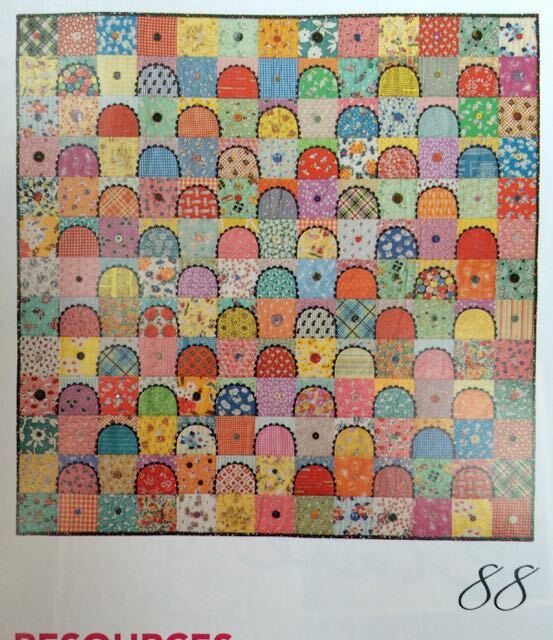 What a happy quilt - I love it and will definitely be seeking out my copy of the magazine. Congratulations! And the quilt looks lovely hanging in your room. Rachel, your goal in life seems to be to cheer up and brighten up everyone's lives - and you certainly accomplish it well! I adore this new quilt, it's very "Racheldaisy" and it makes me very happy! Oh RAchael I am so excited for you.....your quilt is just beautiful...l love It and want to hop in under there and read Game of Thrones! Congratulations Girl.....wooohoooo! This quilt has your name written all over it! Vintage, charming and fun! Congratulations on yet another milestone! I can't wait to see the magazine. Wonderful to see such a bright and happy quilt on a dull winter's day, will have to check out the digital subscription of the magazine now. What a great idea and they look like little doorways to...whatever tale YOU would like to tell and I KNOW you would have one for each little door way!! You are a machine woman. This quilt is amazing, I feel like I say that about all your quilts but seriously I love them all. This one though is.... Wow. I'm going to have to check the newsagents for that magazine so I can have a photo of your quilt to froth over. You are the queen of ric rac! Another delightful quilt, full of joy and bounce. What a lovely happy quilt. The fabric choices are great. Thanks for the heads up that the new mag is in the shops. I'll have to keep an eye out for it. Oh how fun -- what a happy, bright quilt. Definite seal of approval from here!!! Sorry I am so late catching up. But I am having a lovely time reading this post. Your quilt is wonderful. 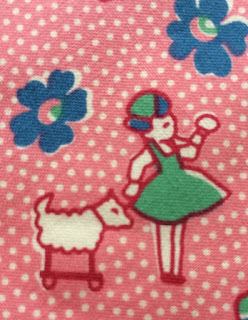 I do enjoy the detail you include in your quilts as well as your fabric selection. And it looks just right hanging in your home. The magazine article is beautifully presented. 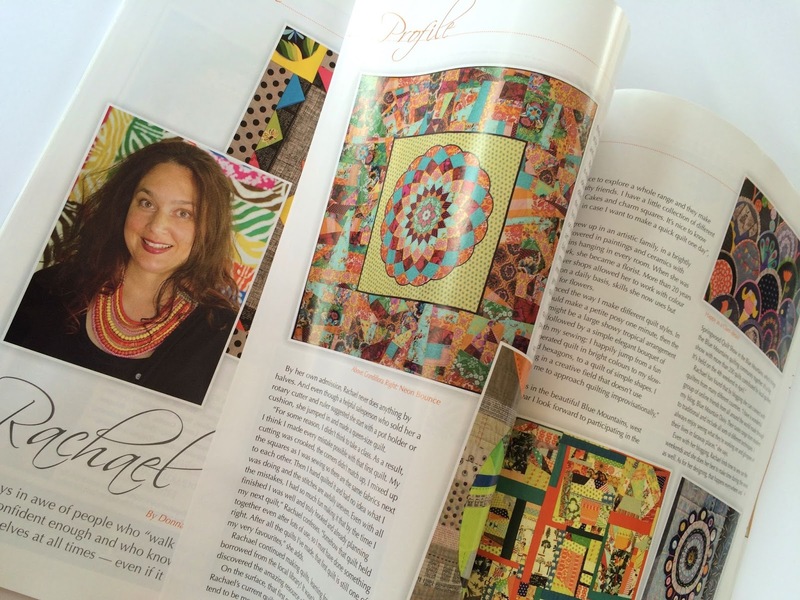 It is so exciting to see you and your quilt in print. I checked the shops yesterday, but will have to go back again to find it. Found your blog via pinterest, love this quilt. Would make a great quilt for all my scraps. 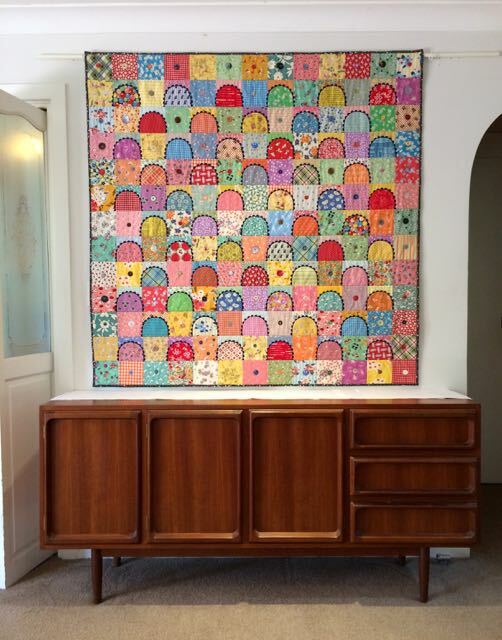 What a cute quilt and how fun to have your own featured interview! I have been searching tirelessly for this copy of the magazine. I can't seem to find a copy anywhere (USA) . How can I get a pattern for this quilt? It is really cute! !